2. Use event tracking in order to see the impact of your effort in order to promote other twitter accounts. You'll be able to see exactly how many visits you generate for their twitter accounts. Things can go even further, but I don't want to get too boring on this. I'm thinking of tackling this maybe on a blogpost or something. If you need some help to implement what I have said above just drop an email and I'll gladly help. 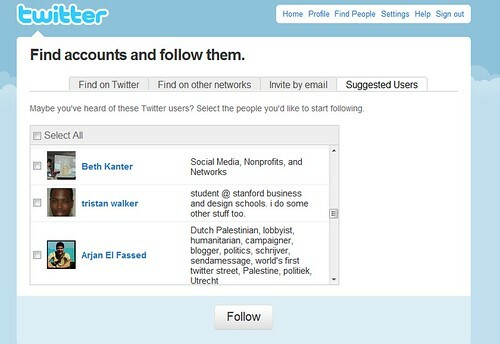 I love the idea of a list of lists of followers for the twitter landing page. I've been kicking around what to put on one for some time, and that seems like a great way to promote friends/passions without a huge list on #FF. I've also been thinking about a way to change the sidebar for when people click through links to my main site from a tweet or RT. This will allow that landing page type personalization and get them straight to the content they came from. Doesn't really change the metrics of it, but it should up the conversion for RSS/newsletter subscriptions. I'd like to see @alscanada (ALS Society of Canada) added and thanks for this blog! Would love it if you added Convoy of Hope: @convoyofhope to the list! And thanks again for Twitterville! Thanks for this post! Please add @loveyourbody to your nonprofit Twitter list. @loveyourbody is the Twitter account for the Eating Disorders Information Network (EDIN) located in Atlanta, GA.
And you should definitely be one of the suggested users. They were spot on! Have you seen TweepML? I haven't used it, but it might be a good format for sharing your suggested lists. We'd love you to include Chicago Dramatists on the list. They're a small playwright's network in Chicago that produces original material. A Steady Rain, by Keith Huff, started at @ChiDrama and is now mounted on Broadway starring Daniel Craig and Hugh Jackman! @VisionAfrica would definitely appreciate a mention on your list of nonprofits. We support 15 different children's projects in Kenya. Congratulations on being a suggested user - the great info you provide definitely merits your place there. Seriously don't know what I would do without your help Beth! We're an umbrella organization for charities and nonprofits in Edmonton Alberta, Canada. 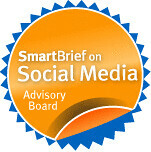 At the moment, preparing a breakfast panel of local social media experts for a Social Media 101! ...then we can start tracking our efforts. Twitter, so far, has been amazing for up to the minute information and sharing. can bring attention, by tweeting about causes and events. Most don't want to follow an account that's all N/P's all the time. But I am told they are inundated with requests. to worthy causes and efforts, is honest, evocative wording. In other words, it goes beyond "spraying the crowd". will likely reshare), has been my best use of the SUL. Really getting a lot out of your blog posts! Can you please add @bmsmusic? Brookline Music School is the oldest and largest cultural institution in Brookline, MA (just outside Boston). Thanks for this post. I've been hearing for some time now that you are "the" person for nonprofit social media, and it's very clear you love what you do and are very insightful with all of it. Involvement in my organization has a tendency to be seasonal, so we use social media to stay in front of our constituents year-round. I, too, tend to get caught up in the numbers and struggle with ways of measuring our impact. I look forward to reading more! I'm surely biased, but I'd like to see @lifeandscience, my place of employment, on the list. It's my colleague @10ch who tweets for us. It all really depends how its used. Content is king and when something can be pushed to the masses then it will catch on. Good read! Beth, StartingBloc (@StartingBloc) is a pretty awesome organization here in NYC. They put on the Institute for Social Innovation, a five-day workshop that educates emerging leaders (typically between the ages of 21 and 29) in areas such as sustainability, corporate social responsibility and social entrepreneurship. These leaders then maintain ties with each other via StartingBloc's alumni network. Awesome to see you doing this. Thanks! Today internet business through internet marketing is common , organizations promote their products and services and reach a bigger range of customers through it . Agree with Avi that TweepML might be worth checking out as a tool for what you want to do with your recommendations. I've used a landing page (http://www.amysampleward.org/welcome/) for a long time now as a way of welcoming people to my site that click through from my Twitter profile and have had a positive response. People don't always want to jump right into conversations (blog posts) that they don't know are coming so the landing page in my situation was kind of a half step into the blog, a minute to explain and welcome and invite before they clicked through to the blog. Very interested in your tracking experiment - will be watching for more! hi Beth, thanks for this post. Sure Start project, a five-year initiative by PATH, supported by the Bill & Melinda Gates Foundation works towards educating pregnant mothers in India about safe child birth. Sure Start promotes safe child birth in Uttar Pradesh and Maharashtra in India.